Yesterday's Web Analytics Wednesday brought about a dozen people, a bit less than the expected 20 or so, but nevertheless some new faces and enough to have very good discussions. Here's a brief recap of the meeting, but if you want a very detailed one, check out YashLabs detailed account. After the usual chit chat and a round table where we presented ourselves, I was happy to share a recent talk I had with M. Scott Wells, senior account executive from Omniture, where we discussed the possibility of having an Omniture Café event in Montréal. I think this is exactly in the spirit of the Web Analytics Association objectives: unite web analytics consultants, professionals and end users to increase our common knowledge and best practices in web analytics. Usability is related to the individual's subjective experience. The same mug I love to drink from is a disaster waiting to happen for my two-year-old daughter. Is the mug usable? Yes, for me. Not for her. P.S. 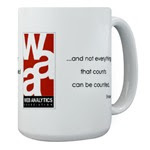 You can get your own WAA mug and other stuff from the new CafePress store!